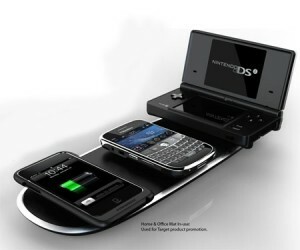 Powermat is a wireless multi charging station where you can charge three devices simultaneously. Once a device is full charged and the Auto shut off has cocuured to save energy, the system will check the status of the battery. If the battery is used, then powermat will return it again to a full charge. There is a magnetic attraction between every Receiver and each access point on the mat that assure a precise alignment which helps to use the most efficient charging, the key of this system to charge your device as fast or faster than the original power adaptor.